Country Mile Gardens offers both design and turn-key installation services. Our Lead Designer will visit your property to assess, measure, and create a customized planting plan incorporating design interventions tailored to your specific needs. From something as simple as a row of trees for privacy, to a complete foundation or entire property design, we have the ability to transform your dreary landscape into your own beautiful oasis for years to come. Please call us at 973-425-0088 or email us for more information. Our Lead Designer, Erik, is very passionate about gardening and working with nature in all of his designs. He has an extensive knowledge of native plants, shrubs and trees of the Northeast as well as how to creatively design landscape spaces. 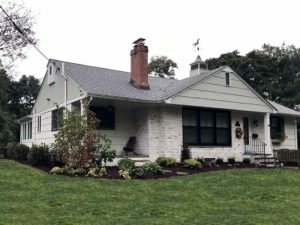 Over the last 20 years, Erik has built a reputation as a valuable landscape design consultant capable of transforming any neglected property nightmare into the envy of the neighborhood. Erik’s completion of the Master of Landscape Architecture (MLA) program at Rutgers has only enhanced his insights into an array of landscape challenges requiring sensitivity to ecological design principles and sustainable planting solutions. Erik’s strong passion for creating dynamic landscape designs combined with his diverse skill set and educational background make him the perfect choice for your next planting design project! 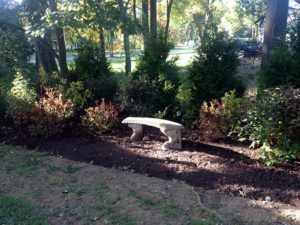 In this project we utilized all the best deer resistant and shade tolerant shrubs to create a clean, simple and low-maintenance design. This local residence was another “blank slate” in desperate need of a makeover! Each side of the house required specific, low-maintenance design strategies such as deer/sun tolerant, deer/shade tolerant and deer/shade/wet tolerant. The foundation of this sprawling farmhouse in Mendham was completely bare and in need of a solid foundation plan to complement the unusual façade. 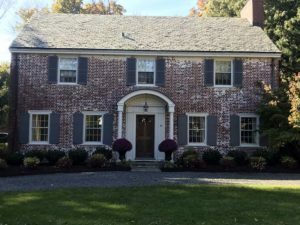 Our Landscape Designer worked with the clients’ needs that included strategically blocking two AC units while not overwhelming the house itself. 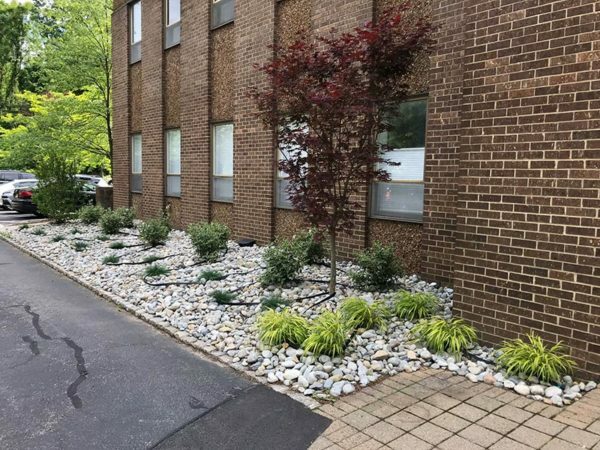 The property manager of this Basking Ridge office building requested our expertise to update the front façade with color and texture to complement and soften the building’s entrance and the existing river rock stone groundcover. The client was truly delighted with the end result! The design for this modern remodel required a palette of low-maintenance, deer resistant and drought tolerant shrubs and low grasses that would not obscure/overpower the new glass façade. The owners of this charming, woodland home needed our help to update a challenging, shady back patio area. 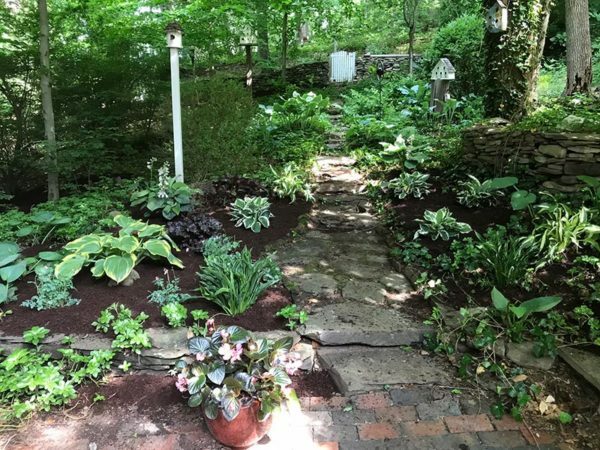 Our Landscape Designer, Erik, called upon his extensive expertise in shade gardens to create an enchanting transformation that exceeded the clients’ expectations. 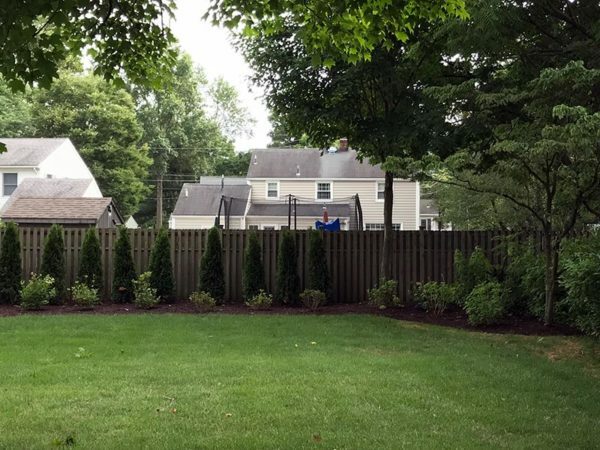 The homeowner of this Morris Plains backyard needed help beautifying her dull and dreary privacy fence. 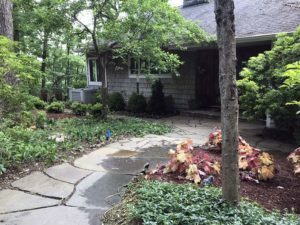 Our Landscape Designer Erik utilized both evergreen and deciduous shrubs along with strategic, walnut tree tolerant understory shrubs to finish off her private oasis. This local Bernardsville home was being engulfed with overgrown, improperly situated shrubs! By providing renderings and an in-store consultation, our Landscape Designer, Erik, produced a “makeover” that incorporated the homeowners’ preferences with additional, unique plant selections that enhanced the front entry sequence. 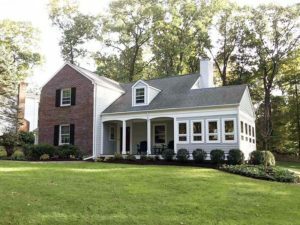 This charming modern home was ready for a 21st century makeover with deer-resistant color and texture. Utilizing a mixture of evergreen and deciduous shrubs with perennials and grasses, the final installed design created a spectacular entry sequence that was described by the homeowner as “truly amazing!”. 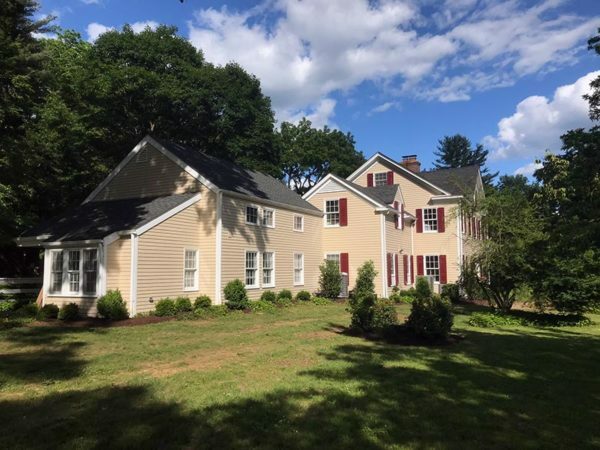 With the kids out of college, the owners of this stately colonial home were ready to focus on their dark, overgrown landscaping. 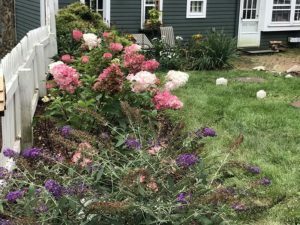 Erik, the landscape designer, worked closely with the clients to create a handsome front planting that includes a variety of textures and colors throughout the season. Erik demonstrated what a dramatic change could be achieved at the front entry with an illustrative rendering and in-house consultation. 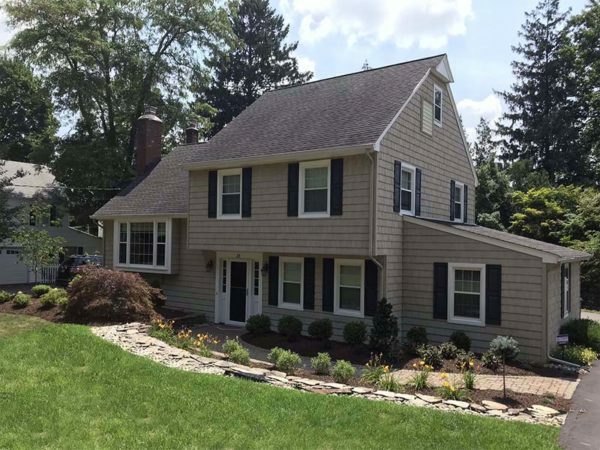 CMG’s landscape designer, Erik, helped the homeowners of this cozy cottage with boxwoods being damaged from snow and ice falling from the steep roof. 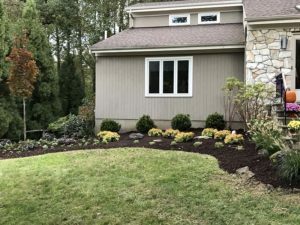 Erik recommended lining the foundation with Duke Gardens Japanese Plum Yews, a graceful, finely textured evergreen shrub with a spreading, mounded habit. Its compact size is perfect for small gardens, low hedges, or borders and its flexible branches will help withstand the punishing snow. 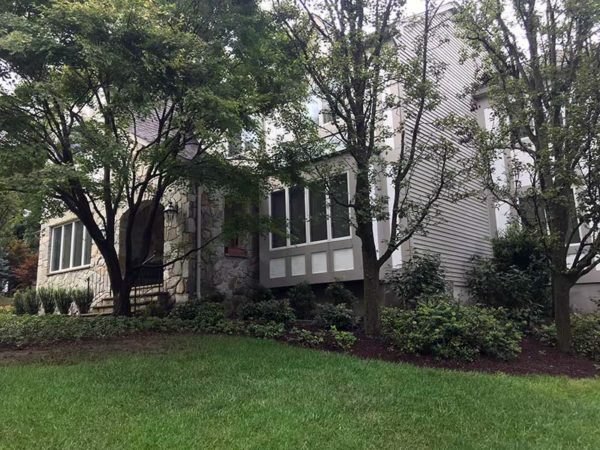 To help maintain a sense of woodland enclosure after losing many trees, this Basking Ridge residence needed just the right combination of shade/deer tolerant Green Giant Arborvitae and seasonal understory shrubs. Our designer, Erik, included a colorful assortment of plantings including fragrant Itea and Clethra to complete this backyard border that is worthy of any upscale park! 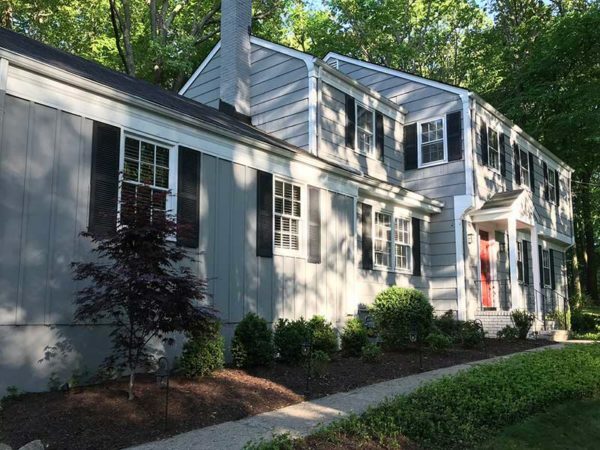 This quaint Bernardsville home was in desperate need of softening unsightly utility pipes and wiring… and within their budgetary needs. Erik strategized a cost-effective and efficient planting plan that will provide privacy and properly frame their newly-painted home for years to come. 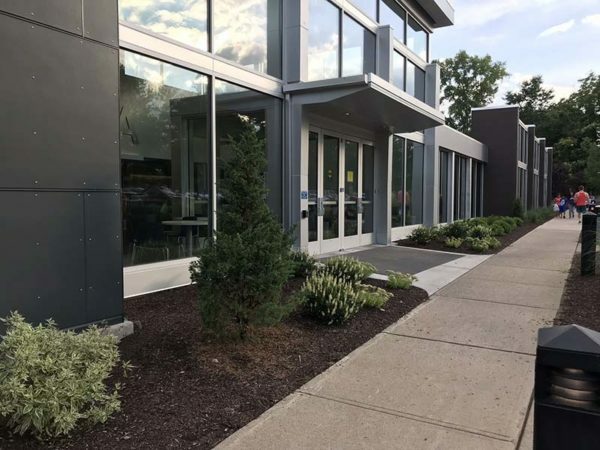 CMG was recruited to help with a strategic front foundation update to help disguise two AC units while still allowing for easy maintenance access in the future. Additional shrub, perennial and clematis vines were included to complete this charming, woodland scene. The client was quite pleased with the design suggestions and strategy provided by Erik. Improperly maintained trees and shrubs were casting a bad light on this local Bernardsville residence. Utilizing illustrative renderings, CMG’s Landscape Designer, Erik, was able to fine-tune a customized design that truly struck a chord with the homeowner. 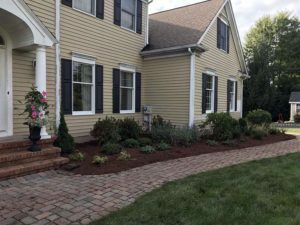 By removing what wasn’t working and adding strategic shade tolerant shrubs and perennials, the front entry porch is now vibrant and inviting! The owner of this mid-19th Century cottage needed help cleaning up and pulling together an inviting look to complete her private woodland oasis. Our landscape designer, Erik, selected just the right combination of flowering shrubs and perennials to provide season-long enjoyment.